Kind of. I have always been in operations, helping to build and run entrepreneurial companies for very talented visionaries. I was typically one of the first ones in the office and last ones out until six weeks after having my first child, when I started going home by 6 pm. But I was so uncomfortable leaving so early (and had so much work to do) that I made up for it by working from home until well past midnight every night after the kids went to sleep. So technically, my job didn’t initially change but the way I approached it did. More recently, however, when my kids were 4 and 7, I started feeling a strong pull away from the office and toward being with my kids to watch them play sports, develop homework routines, and have family dinners. At the same time, my company was growing and becoming more demanding. So I was given an opportunity to work part-time and start the non-profit arm of the company. I love it and haven’t looked back. I continue to supplement this new role at sbe by writing a MightyMom book series, getting involved in local politics, and serving on the board of a local non-profit. While I may be just as busy, the pressure is different and my mind is much more present as I switch roles throughout the day. I’m definitely embarking on a new direction that seems to a better fit at this stage in my life. I just think having “it all” means different things to each of us at different stages of life. I have focused a lot of energy on my career, but I never neglected the joys of getting married and having children, and I am thankful for all the 40-year-old working women who advised me not to miss out on these aspects of life. I might get depressed thinking about “all” I don’t have, but at the end of the day I have what feels right for me. I think I’m terrible at doing nothing. If I cut back on work, I fill it with volunteering time elsewhere. If I am on an airplane with downtime, I’ll write a new book as part of my MightyMom series. I have become so busy as a working mom, scheduling every minute of my day to perfection, that I have nearly forgotten how to just take time out and do nothing. I finally have a regular workout schedule and love it. I don’t feel like I’m just trying to get it over with and move on to the next task, which means I’m much more present and my mind and body are better for it. From your mother? My grandmother said that as long as my kids feel loved, nothing else matters. Meaning, go work, have another kid, go travel, go do what you need to do, just make sure your children are loved and know it every day. From your kids? When I told my kids that I was cutting back on work hours last year, my older son immediately looked up and said “Thank God.” We aren’t very religious, but I knew right then I was on the right track. Just going on a walk or having a coffee with a friend. I don’t get to see enough of my girlfriends, some of whom have been in my life for over 30 years. We are all so busy and rarely can just call each other last minute and do something fun. And now that I think about it, texting has replaced phone calls! When we can catch up, it’s really meaningful. What would you have told yourself 20 years ago? I will always work as hard as I can to keep learning and build a career that I love. It’s important to have “my” thing. I’m so glad I was open to change because it led to so many great experiences that I never would have expected. Driving in Los Angeles from Point A to Point B. I don’t want someone else to drive me, I just want a magical route that gets me where I need to go in the time frame I have scheduled. The President of United States. So many differing opinions makes it nearly impossible to get anything done. The stress seems overwhelming to me. I am reading Grain Brain. Trying to better understand how wheat has changed in this country and how a low-carb diet is better for weight loss and overall health. One of my sons has allergies, so I’m trying to find alternative ways of helping him. Activity? Getting massages once every few weeks. It’s as close as I get to doing nothing. Website? Amazon – I pretty much get it all there. I need 8, but I get 6 or 7, and it’s awful. I don’t have great sleepers in the house, and their little footsteps wake me up. Nothing. My mornings are all about getting my kids ready for school and then I’m off to work. I sneak some emails in-between and my husband shouts out any big news headlines as I cook breakfast. I think I: am really lucky. I wish I: could sleep more. My kids: have changed my life and made me a better person. 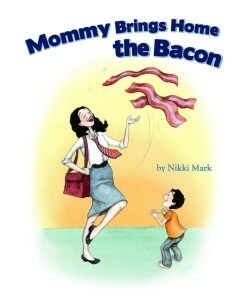 “Mommy Brings Home the Bacon,” the title of my first book in the MightyMom series. For a few years it was a fun way of letting the kids know I was off to work. 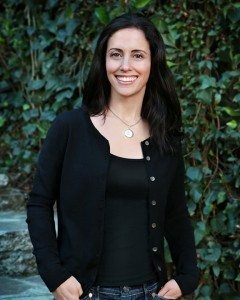 Balancing her roles as Executive Director of sbe Foundation and raising two children, Nikki is intimately familiar with the challenges and rewards of being a working mom. Passionate about reading books to her children, Nikki was driven to write “Mommy Brings Home the Bacon” for her young boys after quickly realizing how few stories covered the subject of working mothers. Nikki was born and raised in Los Angeles and currently resides in her hometown with her husband, children, and rescue dog found at the bottom of the Grand Canyon. She holds an MBA from the Thunderbird School of Global Management and a BA in Communications from the University of California Santa Barbara.